Hello again, Ashes players! Earlier this week we took a look at some of the ready spells Echo uses to defy gravity and turn the tides of battle in his favor. Now its time to dive back into the Path of Assassins side of things and see what ready spells Jericho has planned. We already have seen how Jericho can Build Magic to place cards underneath her to Re-Tool it into damage or healing, but her tricks don’t stop there; Prepare can allow Jericho to continue to add cards underneath her to get even more activations of Re-Tool Magic! 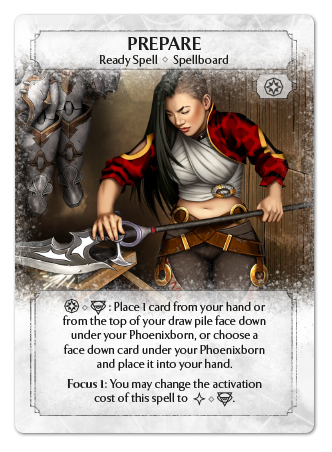 In addition to pumping up Jericho’s ability, Prepare can let your Phoenixborn plan for the future. Use Prepare to stash some key cards for later in the game, such as Sympathy Pain or Meteor, and pull them back to your hand when the time is right! By not feeling pressured to hang on to these cards, you are able to get a full refill of your hand during the draw step, all while dodging the draining stare of a Three-Eyed Owl. Focusing Prepare can help expedite the process even more, giving you more activations of this spell with the added flexibility of costing only a side action. Few cards in Ashes are as cheap and flexible as Prepare, so I hope you look forward to taking advantage of the utility that this card provides! Here we have the first unit of Jericho’s army; the Turtle Guard! There is nothing typical about this conjuration. 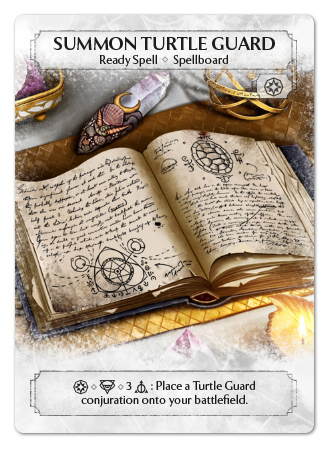 The Summon Turtle Guard is the first all-basic summon ready spell outside of Phoenixborn exclusive cards, so everyone has the option to run this unit. 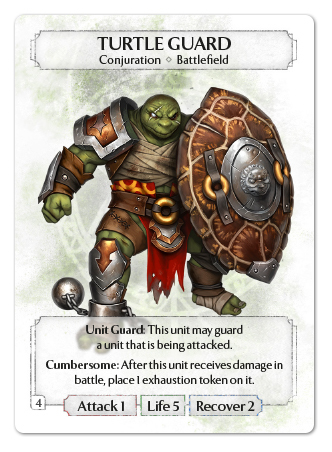 You may find yourself in dire need of the Unit Guard ability, but may be lacking the dice types necessary to include it in your deck. Turtle Guard may be the solution to your problems, but they do not come without drawback. The Cumbersome ability will limit how often these guys can jump into battle. Perhaps you can take a page out of Echo’s book and give them a lesson in Gravity Training? 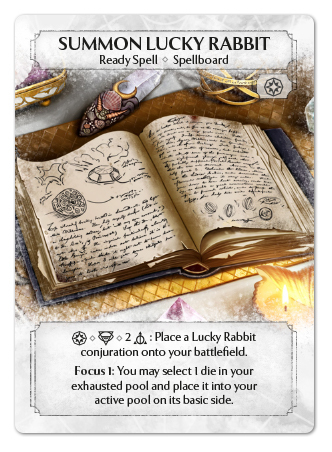 And last, but certainly not least, we have the Lucky Rabbit! These little guys play a critical role in Jericho’s base deck and they so in style! 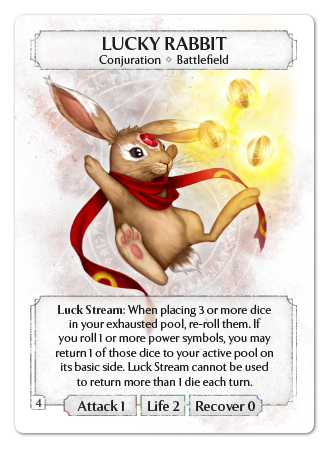 Summoning large basic units like the Turtle Guard are going to quickly drain you of dice, but the Lucky Rabbit offers you the chance to recoup some of those expenses each time you pay a cost of 3 or more dice. Once you hit Focus 1, the Lucky Rabbits become one of the cheapest summons in the game! You also get the added bonus of recurring dice types that you may want more of, but you’ll have to Meditate to get those dice from their basic side to a more functional state. That’s all for previews this week! 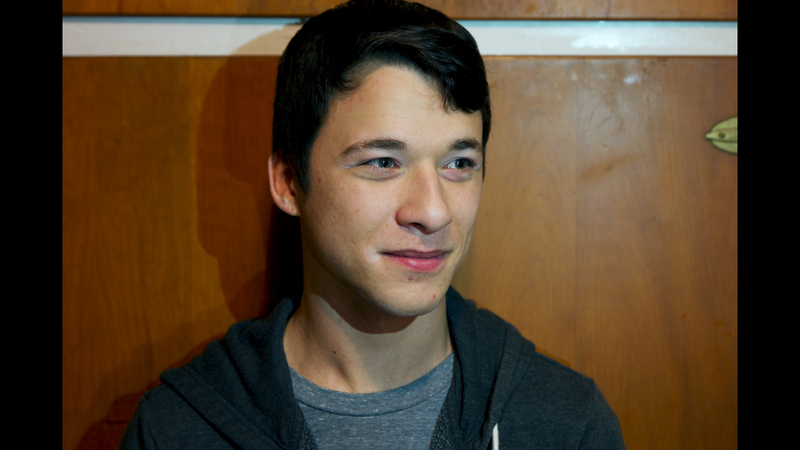 If you haven't already, be sure to check out our previous preview articles for Echo and Jericho as well!. Remember, both the Path of Assassins and the Masters of Gravity expansion decks will be available November 9th! I’ll see you all next week as we return to take a look at the elite warriors from the Masters of Gravity.